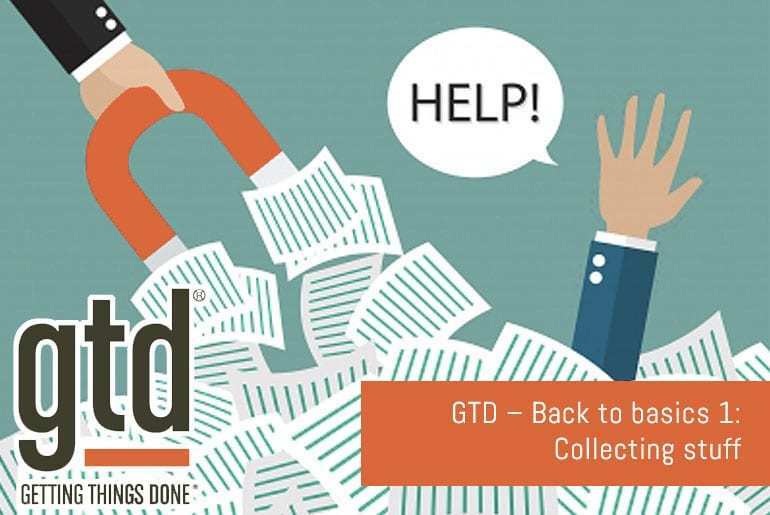 Today sees the start of a new series on Getting Things Done – GTD: back to basics. Some of you may be new to Getting Things Done, others more familiar with it and its terminology however sometimes it’s worth revisting everything for a little refresher to help us refocus and “Stay on the wagon”. In this first post we’ll discuss the first step of the Getting Things Done process, “Collecting Stuff”. Stuff is literally anything that clogs up your brain, taking your focus away from what you should (or could) be doing. Stuff can take many forms, it could be physical (that pile of paperwork on your desk, or the bills that you need to pay) or mental (the nagging voice reminding you to do something that you never seem to get around to). Basically stuff is anything that’s screaming to get your attention, that gives you a sense of guilt over not doing, makes you procrastinate or that keeps you awake at night. How do you collect this stuff? Get yourself a nice big container (or containers) and literally dump everything that’s outstanding into it. All of the letters, bills, receipts, magazines, books that are viying for your attention should get dumped into the collecting bucket so that you can go through it later. Mental stuff is anything that’s floating around your head and that pops up when you least want it to – like when you’re trying to fall asleep. Don’t worry about categorising any of this stuff at the moment, just get it all out of your head and onto paper. Pretty soon, when you’ve got everything down, you’ll start to feel a lot better about yourself. Personaly, when I did my first sweep for stuff I had the best nights sleep I’d had in a long time! Just knowing that I was starting to collect stuff made me feel a lot more relaxed and at ease. In the next part of this series, we’ll look at “Dealing with all your stuff“. « Will Facebook damage your career?